All of our Safety Glasses are Impact Resistant. 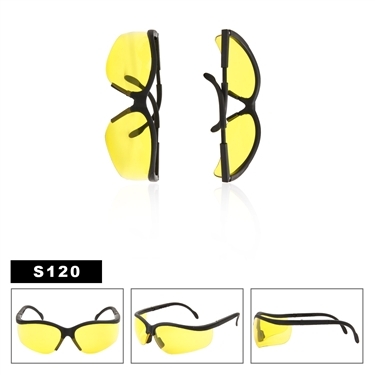 Yellow safety glasses, commonly used as driving glasses with adjustable arms and a black semi-rim frame style. All of our safety glasses come in designated lens color. Every dozen will arrive in a custom designed free display box. Each pair of safety glasses is wrapped in a poly bag before being placed in the display box to ensure that they stay in perfect condition. Click here for more information on our custom designed display boxes.